An easy dinner that cooks all day in the crock pot or slow cooker! Garnish with shredded cheese sour cream and tortilla chips as desired. First you need to brown your ground beef and drain off any excess grease. Add all of the listed ingredients into your crock pot and stir. Serve with shredded cheese, sour cream and tortilla chips for the perfect meal! This makes a large pot of soup. I use my 7 quart slow cooker for this recipe. 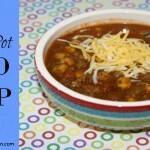 You can cut the recipe in half and use a smaller crock pot! I use the tomato sauce if I have it on hand, but if I don't it still tastes great!